a few years back, i had yocards made that advertised my professional services. these yocards never stayed too long on the public display racks though because people would hoard copies not only for themselves but for their friends too. before the last of my yocards disappear, i thought of posting it here in the first entry of my blog. this yocard contains a personality test based on max luscher's research on color psychology. just to make the test more meaningful, make sure to pick a color before you scroll down for the interpretation. VIOLET reveals your need for tenderness, to impress, or to be liked by others. GREY reveals your need to be uninvolved or remain uncommitted. RED reveals your need to experience life fully and intensely. GREEN reveals your need to be recognized or to prove yourself. BLUE reveals your need for peace, rest, and harmony. BROWN reveals your need to relax and recover from discomfort. 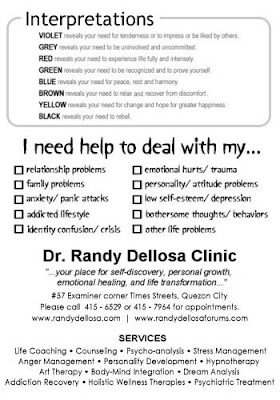 YELLOW reveals your need for change and hope for greater happiness. BLACK reveals your need to rebel. well dude, how did you fare? i hope you enjoyed learning about yourself. oh, and by the way, you might want to share your results with me! P.S. since we've been discussing colors at this time, let me close today's blog entry by challenging you to play a mean color game at this site: www.humorsphere.com/fun/8787/colortest.swf. i hope you not only enjoy the game but score well, too- hehe! 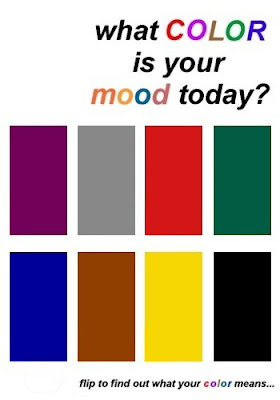 Mine's grey!😃but i cant seem to connect it sa day or present situation ko. Or baka in denial lang.😊Nevertheless, its fun to know na may psychological meaning ang mga colors. May interpretation din bakit nag iiba ang favorite colors mo as you grow? Like I used to love everything violet as a kid. Nung teenager,green; young adult,earthtones. Plus I used to hate the color orange, but now I find it bright and beautiful at least in some shades.